The Nordic Walking School was founded in 2003 to teach and promote the therapeutic benefits of Nordic Walking. Nordic Walking is becoming more and more popular, and we're excited to have introduced so many people to this healthy leisure sport. Become a qualified Nordic Walking Instructor with the Nordic Walking School: sign up for our special Instructor Workshops and supplementary modules and learn how to teach and promote all the health benefits of Nordic Walking. As Nordic Walking Yorkshire we also offer regular Nordic Walking courses and workshops for people of every age and fitness level, based in the lovely Yorkshire town of Ilkley. With its broad pavements, plentiful countryside footpaths, and of course Ilkley Moor it is an ideal place for Nordic Walking! We know many people are passionate about walking and trekking, so we're pleased to be able to offer them the perfect holiday - tailor-made walking/trekking holidays to Germany, Austria, Switzerland, or Italy. 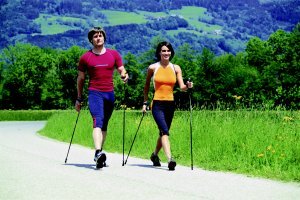 We recommend the fabulous Komperdell Nordic Walking and Trekking poles, and sell these through our online store Walking Sport.